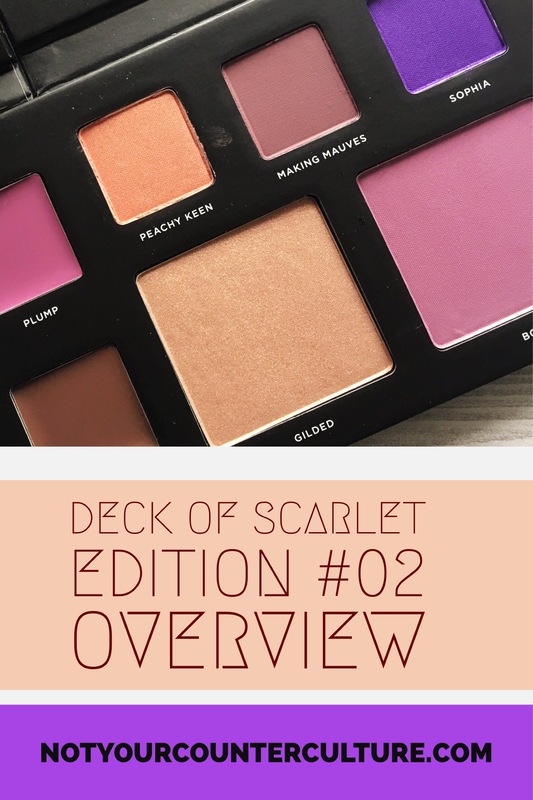 Deck of Scarlet – new makeup subscription is a bi-monthly makeup subscription for $29.95. It was started by the same people bring us Scentbird. Every other month you get a palette with three eye shadows, two lip colors, two face colors, and one or two add ons. It allows you to create a multitude of looks with one easy to store palette. I’ve been subscribed to Scentbird since early last year so signing up for Deck of Scarlet was a no brainer. This overview post is from the first summer palette for 2017. Again, something that might be a little confusing for people new to Deck of Scarlet is the numbering of this palette. While it’s listed as Edition #02, it’s actually the fourth palette from the company. This is listed as a summer palette and this time I fully agree with that. The colors are fun and vibrant, perfect for creating a summer sun kissed look or something a little more daring for a night out. The artist in chief for this is BabsBeauty. Out of all the different companies that are doing makeup collabs with beauty influencers, I believe Deck of Scarlet is really getting it right. They’re keeping things simple with having a standard set amount of product for each release and most important of all is the diversity of the people they have worked with. What you end up with are makeup collections that truly work for a variety of skin tones and are diverse. The first eye shadow is Peachy Keen. Unless you’ve been living under a rock for the last year, you know how popular peach shades have been lately. This one is a beautiful shimmer shadow in a light peach. The second shadow is Making Mauves, a perfect compliment to both of the other shades in the palette. This one is more of a matte shadow and is great for creases and the lower lash line. The third eye shadow is Sophia, a bright purple shimmer. This color is fun to pair with either of the other two, or both, to create a wide range of looks. Personally my favorite is creating a halo look with Peachy Keen to really bring out the green in my eyes. It’s super pigmented so a little goes a long way. As with the other past palettes, there are two cream lip colors. Both of them are silky, smooth, and easy to both apply and wear. They are long lasting and hold up well through a meal. The first is Plump. It’s a beautiful and bright purple shade that is perfect for day or night. So far I’ve loved pairing it with the lip crayon to create different intensities for my lips. The second color is Brownies and it is true to its name. A beautiful brown color that looks a little matte after applying. It’s a lighter shade of brown so it won’t be too dark for anyone. The highlighter in this palette is Gilded. It’s a gold/peach color that compliments the eye shadows really well. It makes for an excellent under brow highlight for whatever eye look you’re rocking. The second color is a blush called Bobdy. It’s another mauve shade but it’s a little more pink and brighter than the mauve eye shadow. I think this blush will also work well on your eyes too. Of course its a beautiful blush as well and can be used minimally for a light look or layered for something more dramatic. Out of all of the add on products we’ve received so far, this one has to be my favorite. The graphic lip crayon Mia is a dark mauve color, and by dark I mean beware if you’re going for a daytime look. When I first played with the palette and did a halo eye look I used it for my lips without realizing just how dark it is. However I added the Plump lip color on top to brighten it up some. Unfortunately I don’t have any pictures of a look with this palette yet! I also won’t have any for my next couple of review posts but that’s because I have something super exciting planned. I’m going to be teaming up with a local makeup artist to do some looks! Check out her Instagram at graphikcosmetics and give her a follow! Interested in this palette? You can purchase it here!